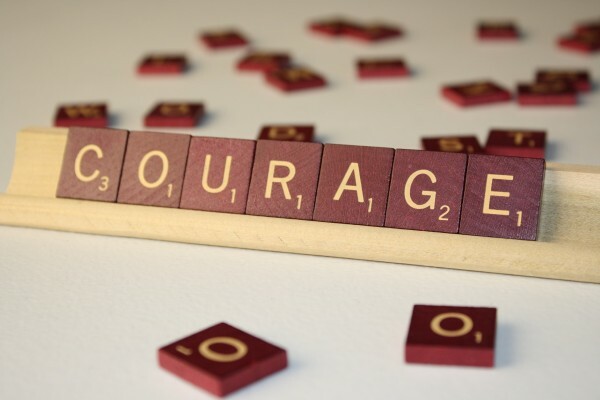 This post is part of the June Synchroblog: Ordinary Courage, where bloggers are invited to write about ordinary courage. The other contributors for this month are listed at the end of this post. What is courage? What does it mean to be courageous as a person of faith? The dictionary definition speaks to having the mental or moral strength to preserver and overcome difficulty, danger, or pain. Using this definition, I don’t think I know a single person who hasn’t been courageous at one time or another. Yet, if asked, I believe most of us would hesitate to call ourselves courageous. Why is this? Why does loving someone deeply give us courage? Because loving someone deeply requires that we are vulnerable. Everyone has been hurt – emotionally, physically, spiritually. To return to love, to open one’s self to another, to the possibility of more hurt, is a huge risk. Yet, if we do not do so, if we are not courageous, the “hurt” wins. The one(s) who hurt us in the past win. More importantly, when we forfeit the chance to love and be loved once more, we lose, and so do those who do not get to feel and return our love. Our ability to love and share love with others in one of the greatest gifts we are given. Love is so unusual; the more you give away, the more you receive back. But the church for the most part does not value all love equally. The only virtuous love that many churches hold up is that of familial love, particularly that between a man and a woman in marriage. Where does that leave our single brothers and sisters? Where does that leave those who have lost a spouse? Where does that leave the love between those who are not related by blood or marriage; that of friends? Courage is loving others even when we do not feel lovable in return. Courage is loving those that others have deemed unlovable. Courage is loving those who have hurt us, when doing so is healthy for us and does not enable further hurt. Courage, particularly for many introverts, is saying that first hello. Courage is facing rejection with the knowledge that until we trust in the holy when we reveal part of our self, we are destined for only superficial friendships. Say that first hello. Love your brothers and sisters, familial and not, with abandon. Be courageous. There is nothing ordinary about it. Be extraordinary. Wonderful post. Sometimes I get so caught up in what I am doing, I fail to see the acts of ordinary courage that I am missing all around me – to tell people I love them, to help meet a need, etc. Thanks for the reminder. Glad you got something out of it, Jeremy. I had not seen that Lao Tze quote – thanks for sharing it. Thanks Carol. I would love to hear back from you on how the challenge goes for you. Great post! I really love the quote. It is something I will be meditating on for a while. The quote is so powerful for such few words. I hope your meditation on it brings you to wonderful new places.